Board meetings are held on the second Wednesday of each month at 6:30 p.m. and on the last Wednesday of each month at 8:00 a.m. Meetings are held at our District Office at 1220 Lakeway Dr.
Can I attend a Board meeting? Can I speak to the Commissioners at a Board meeting? All Board meetings are open to the public, and anyone is welcome to attend! There are opportunities for public comment at the beginning and end of each meeting to give anyone who wishes to an opportunity to address the board. If you would like to make a request of the board, please submit the request in writing at least a week before the meeting in order to have it on the agenda for review. How do I request an action by the Board of Commissioners? If you would like to request action or submit a petition to the Board of Commissioners, you can do so in writing by mail, e-mail, or in person at our office. Requests must be received at least one week prior to the Board meeting in order to be included on the agenda. If they are received within less than a week, they will be added to the agenda for the next subsequent meeting. You may attend the meeting if you would like to address the Board directly. If you do not attend, you will be contacted after the meeting with the result of your appeal or request. 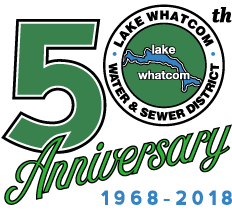 Lake Whatcom Water & Sewer District is currently recruiting for a full-time, entry level Maintenance Worker I. For more information, click here.